Suitably re-invigorated by my epiphany of the previous afternoon and the pleasant surroundings, I was, once again, heading off from my campsite in a good mood. The only cloud on the horizon was the knowledge that the tailwind I'd enjoyed most of my trip would be working against me all the way to the ferry at Craignure. Cooler than it had been, the sun was playing a bit of a waiting game too. ...I'm not sure if that best reflected my state of mind or if it was directions to the local amenities. The descent down to the sea at Loch Spelve proved to be absolutely fantastic. The anticipated headwind had failed to show up and with a good road surface, easy corners and no traffic,I made some of the best speeds of the whole trip. What's more, the sun was popping out and everywhere just seemed so fresh. Before I knew it, I had arrived at Craignure and I could have caught an earlier ferry than I'd planned. However, I opted to chill for a while in the sunshine and had a leisurely full breakfast courtesy of the Craignure Inn. Soon enough, and after a relaxing sit in the sun, the ferry was back and I was off to Oban where Mim was picking me up. Another great trip completed. Overall, this proved to be an excellent route. The Hebrides end-to-end is often touted as one of the great road tours in Europe - and rightly so - but I seriously think that this trip rivals it. Perhaps not so many sandy beaches (though there are still loads) but the combination of mountain and sea is unrivalled and the roads are mainly just as quiet. People I spoke to en route were very friendly and it has the advantage of easy access by rail at both start and finish. I'll certainly be recommending it in future. Kit-wise, everything worked out pretty well. I'm still finding the Scarp tent to be very well thought out and spacious. The stove, sleeping bag and mat (which are all recent acquisitions) all worked flawlessly. Carrying the camping gear turned out to be less of a burden than I'd anticipated although it helped that I'd cut right down on clothing. Having the flexibility of carrying my accommodation with me meant that I could change my plans as I went and this helped me stay a little ahead of schedule each day, even though I didn't wild camp at any time. The Amazon just carried on working the way it does. After some previous high-speed instability, I'd been worried that putting even more weight on the rack (the camping gear) would exacerbate this but the Woodchipper bars, and a bit of me shifting my weight forward on fast descents, seem to have calmed that down. I might investigate alternative forks with either rack or "Anything Cage" mounts to let me spread the weight a bit more evenly. Food-wise, I decided to forego the energy products. Normally, I'd take some bars and some Torq powder for a drinks bottle each day but that just means carrying more stuff from the very start. I didn't feel I lacked power at any point though I could do with being a bit more disciplined about eating as I go rather than waiting and bingeing! I do feel there's not much needs changing now, so it's just a question of sitting down with the maps and working out more routes - not that ideas are hard to come by! Once again, I found myself awake early and keen to get on the road. That's always re-assuring when you are in to a multi-day trip. Eating and packing whilst trying to keep as quiet as possible, I was on my way be 7:30 - before any of the other campers had shown themselves. Having been to Mull only once before, and that on a bit of a rush-job Munro-bagging session, I was really keen on seeing a lot more. I'd had a good look at the map and had already spotted that (a) there were few potential food stops and (b) there were a lot of hills. My route was also subject to some deviation as there had been some bridges damaged in the previous weeks flash floods and the road was still officially closed. The detour would add 14 miles on to my days riding but, more importantly, would prevent me from riding a section I'd been looking forward to. The initial stretch of riding this morning had me climbing away from the campsite for some time before a lovely, fast descent into a still-sleeping Dervaig. Next was Calgary Bay, somewhere I've oft seen discussed and that I'd considered as a potential stopping point for this tour. Right enough, there were a few tents and campers dotted around the designated "wild" camp spot, but given how tired my legs had felt arriving in Tobermory last night, I was glad I'd decided not to crack on this far. From here, the road simply got quieter still. After a while I started to take note of each house I passed, in case I had some mechanical failure and needed assistance. In the mean time, the stunning views of coast and mountains continued round each corner and over each hill., of which there were many. After passing the turn off for the Ulva Ferry, I started my circumnavigation of Loch Na'Keal which meant I was now heading towards the dark clouds which had been gathering over the Mull mountains. Sure enough, it wasn't long before the first spits and spots of rain started and before long I had to admit defeat and don the waterproof jacket. This loch was absolutely teaming with wild-life. Sea Eagles, geese and more heron than I've ever seen before seemed to be queuing up to take advantage of what must be an abundant fish supply. The weather decided to clear up for me again which was slightly ironic given the damage caused by the rain the previous week. The first two damaged bridges were passed easily enough by the use of temporary diversions. The third required a bit of a paddle across a wee stream. The local council workers were happy to chat for a while and we were soon discussing the old bridge at Loch Loyne. It was a shame to see what had happened here as these old bridges were to be replaced by pre-cast concrete culverts. I now found myself approaching the rather formidable cliffs I'd spotted from earlier in the morning and wondering where, exactly, there would be space for a road. I needn't have worried, the road engineers had managed to build/use what amount to not much more than a little shelf, just wide enough for he single thread of tarmac. After yet another hard, but gradual, climb I found myself heading swiftly down towards Loch Scridan and what I hoped would be a chance for a coffee stop. However, I was only to be disappointed as my target, the Kinloch Hotel, was very much closed for business. After enquiring of a local, it seemed that my earliest opportunity would be at Bunessan so I wolfed down a Snickers bar and set off over more undulating terrain. After what seemed like hours, and definitely one or two hills too many, I eventually rolled in to the Bakehouse for a well-earned rest. I wasn't in any hurry. Once again, I'd over-estimated my journey time and with no definite ferry schedule, I knew that I'd make it across to Iona without any problems. Eventually tearing myself away, I headed across the last headland towards Fionnphort. Compared with the rest of my day, this came as a little bit of a surprise with loads of folk milling around, coming off, or going on to the ferry and as we made the short sea journey, I got my first decent view of Iona and the abbey. Soon enough, we were all disembarking and I was looking for the campsite. Thankfully, a handily-placed notice board highlighted all the island amenities and I set off for the short trip across to the west side of the island. It seems I made the wrong choice of route though and I had to negotiate a few closed gates and some gravel track before I found the signposted house. I have to say, I was somewhat confused. I'd not expected much, but the house beside the "site" was empty, there were no tents visible and what looked like a small toilet block was in a field of knee-high grass. I hung around for a while looking for inspiration, but none was forthcoming. It was around this point that I thought I might change my plans. Originally, I was going to camp on the island then wander around a bit, taking in the various sights. In light of the time of day I'd arrived, and the somewhat questionable facilities, I decided that I'd take a good look around before pitching the tent. In all honesty, I was somewhat underwhelmed. I'd come to Iona expecting much more. I'm not a religious person, but I can't deny that the history of Scotland was heavily influenced by this Island and many other folk had spoken and written of a special spiritual quality. For me, perhaps inured by my recent trip to Harris and Lewis and my current tour, I only really saw another windswept Hebridean island - one which was pretty commercialised. After a brief spin around, I decided I'd just head back over to Mull for the evening, thereby avoiding any ferry delays in the morning. A bit down, I joined the queue for the ferry. Looking over towards Fionnphort, in the far south, hazy but clear against the sky, I could just make out two mountains. I knew instinctively that I was looking at Jura. And that's when it hit me - Iona wasn't the end of the journey, the path carries on and it's the path that makes the travelling worthwhile, not the destination. Hopefully, my path will carry on for a good while yet! Bouyed up by my revelation, I headed back to Mull in good spirits and located the campsite at Fidden. While it might just have been my sudden good mood, I was absolutely knocked out by the place. On a beautiful little sandy bay, with lots of little rock outcrops and decent facilities, this has to be one of the top campsites in Scotland. I found a little shelter for my tent and sat out on the rocks eating the food I'd carried since Kyle and watching the sunset. This was everything I wanted my cycle touring to be about. I awoke at 6 after a great nights sleep. I'd actually left one of the tent doors open so that I fell asleep and woke up to the scenery. It's not something I'd normally do, but a combination of the better weatherproofing of the Scarp tent and a dab of Smidge before bedtime is making me a bit more comfortable about any late-night intrusions. Somewhat cloudier than the night before, the wind had also died down a fair bit and a few midges were dealt with whilst having breakfast and packing away. I was careful to pack all my "overnight" stuff in one pannier and everything I'd need for the day in another. That's just my way of having less faff when looking for waterproofs, food or other items throughout the day. I was on the road for 7:30, with a few other campers just beginning to stir as I made my way out. never the busiest road, this also meant I had little traffic when heading towards Lochailort. I knew that there would be a few wee climbs today so I was pleased when I dispatched the first couple with little effort and I made use of the relatively new cycle track where possible so that I could dawdle along with less care about passing vehicles. My first stop of the day was actually at the Princes Cairn. This is one of those Bonnie Prince Charlie locations that I've frequently passed but never stopped at until now. 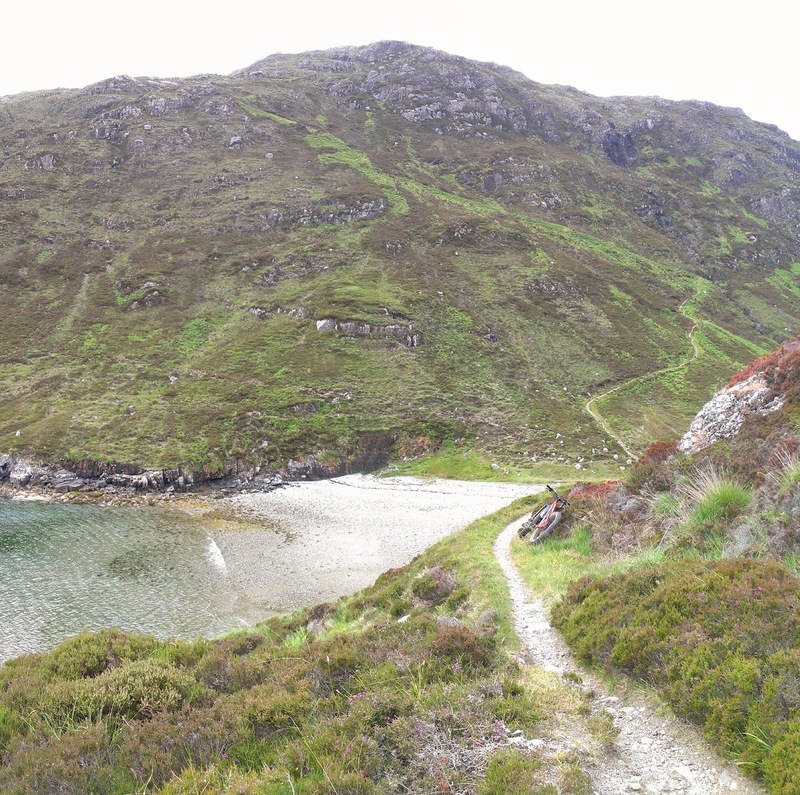 The turn off at Lochailort was one of the points I'd been most anticipating. This part of Scotland is pretty much overlooked by the hillwalking and biking scene and I feel that's a great pity. I was looking forward to seeing it in a bit more depth. Again, I was making pretty good time - so much so that I passed a planned stop at Glenuig as there was nowhere open. Passing Ardmolich, I was confronted by Drynie Hill, one of the wee climbs I'd been expecting. It was nowhere near as bad as I'd feared, but then not being in a hurry, I was content just to get up and over it at a relaxed pace. From the top, I could see over the (currently hidden) Loch Shiel towards the hills of Sunart, an area I'd been mountain biking in only past year. I really love being able to join up these areas in my own in-brain "map" of the world. As for Loch Shiel itself, that looked completely alien to the wilder, mountain-sided loch familiar to me from the Glenfinnan end. Down here, it's a placid, wide body of water surrounded by green pastures and where it flows out to the sea there's a lovely old castellated bridge over the slow-flowing river. Acharacle follows and that's where I eventually stopped. Unusually for this part of the world, it was positively awash with tearooms and I was happy to be able to avail myself of apple pie and coffee outside to enjoy the morning. The next junction, at Salen, is the start of one of those Scottish cul-de-sacs, the type that go on for miles. 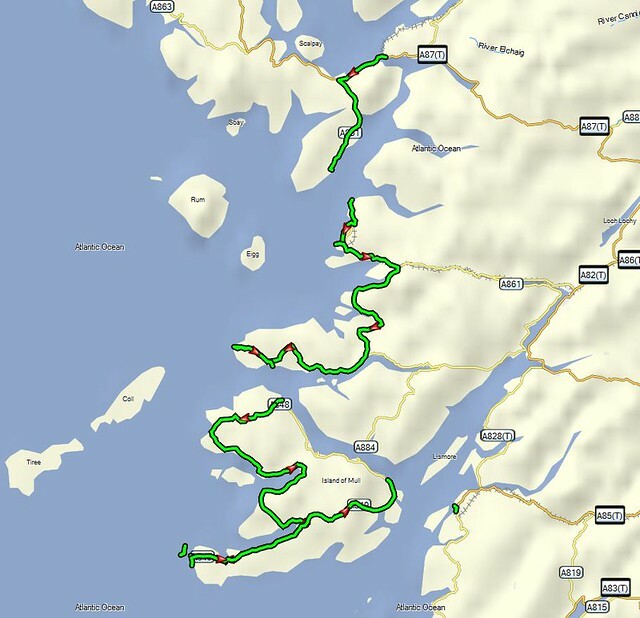 The weird thing about this one is that, unlike the other sea lochs I'd been circumnavigating all day, I'd not be coming back along this one, with a planned stop at Kilchoan campsite and a ferry to Mull the next day. The ride alongside Loch Sunart is really spectacular. each little rise seems to bring another viewpoint and the wooded sections (globally important temperate rainforest) are particularly pleasant. If there's one thing worrying me, it's that dark clouds are gathering over my shoulder, rather belying the blue skies in front of me. Again, I'm making good time and I do some recalculating in my head, juggling ferry times and snack stops. As I reach Kilchoan, I've just about made my mind up. I can head to Ardnamurchan Point, eat, and still make a ferry across this afternoon. With that plan now put into action, I turn northwards for the first time in a couple of days and meet head-on the wind that had been at my back so far. This last little section of road seems to go on much longer than it should, not aided by the steep little kickers needed to get over to the lighthouse. However, once I'm there I head round for a few photos and pop into the little cafe for some food and drink. It's almost exactly 30 years since I was last here, previously arriving on a motorbike. It's certainly a bit more lively now, with the cafe and visitor centre and what must be the UK mainlands most westerly set of traffic lights! Suitably refreshed, and after chatting with various other folk making this rather out-of-the-way place part of their holidays, I head back to Kilchoan and the ferry over to Mull. Another lovely sea trip sees me land at Tobermory in search of the campsite which, if memory serves me correct, is on the Calgary road. This proves to be the case, which is a bit of a shame as that involves cycling up the rather steep Back Brae with cold muscles and this proves to be one of the few times on the trip that the added weight of the camping gear is actually felt. The site itself is just about OK, if rather non-descript. I'm glad that the breeze is keeping the midges at bay because the rather wooded nature of the site makes me think it could be pretty hellish otherwise. After a quick walk into town for dinner, the rain which had been threatening all day finally arrives. The irony of getting wetter walking around than during my 100+km of cycling is not lost on me but it soon goes off again in time for the stiff walk back to the site. Again, I'm ahead of schedule and I have a relaxing evening knowing that I can head off whenever I want to in the morning without worrying about ferry times. I have a plan. It's sort of evolved itself with some random beginnings and sprung to me almost fully formed earlier this year. However, I've not been in a position to do much about it until the option of a few days away came up and I was able to sit down with the maps and do a little route planning. As a result, I'm on my way to Kyle of Lochalsh courtesy of Scotrail and some of its random booking practices. In this case, despite getting verbal confirmation that my bike was, indeed, booked all the way from Edinburgh to Kyle, I find that the first leg - to Perth - is a first come, first served cubbyhole barely large enough for two bikes, and there's one in there already. I've also opted to take the camping gear for a change. For my previous road tours I've made use of hotels and B&Bs, but I wanted the option of some wild camping and also the flexibility that not booking ahead offers. Of course, this means a heavier load, but I've pared down as much as possible in order not to make it too uncomfortable on some of the inevitable hills. Kyle is looking great. Manoeuvring away from the station, I make my way towards the bridge for the compulsory photo and I'm pleased that there's a reasonably brisk Northerly wind. The first leg of my journey is to Armadale and I'm hopeful that I'll make it in time for the last ferry across to Mallaig. Right enough, as soon as I reach the turn-off and head South, it's like a massive push in the back and I feel I'm fairly flying along. With this encouragement I decide to forego a snack stop and push on, not feeling the weight of the camping gear, reaching Armadale and the ferry terminal with loads of time to spare - enough time for food and a coffee at the cheery little pier-side cafe. The ferry trip from here is well worth it. On a good day like this, views across to Knoydart and into Loch Nevis are stunning and the whole trip is only spoilt by having Mallaig as a destination. Still, there are some shops and a bank and before long I'm off along the roadside cycle track, through Morar and heading for Arisaig. Just before the last climb, I wheel off towards Back of Keppoch where I know there are a couple of decent sites and I opt for Gorten Sands. It's the last site on the track and has some beautiful little coves and a roped off area for smaller tents. I'm able to pitch in a little shelter but giving me a nice view North East so I'm very happy. After a quick shower, I hot-foot it along the road to the pub - the Cnoc na Faire - in search of some food. Although I'm past the last food order time, the staff are happy to whip me up a fish and chips, and what a fish and chips it is. The tartare sauce is complete with whole capers, the chips are hand-cut and there's a generous portion of mushy peas to go with it. I'm very impressed. The last time I was in this pub was some 30 years ago and it was a smoky little dive of a place serving not much more than fizzy lager. By the time I've finished, the sun is almost setting so I order a single malt (I go large at the barmaids suggestion) and wander out to enjoy it. What a great start to my my wee trip, a couple more days like this please. 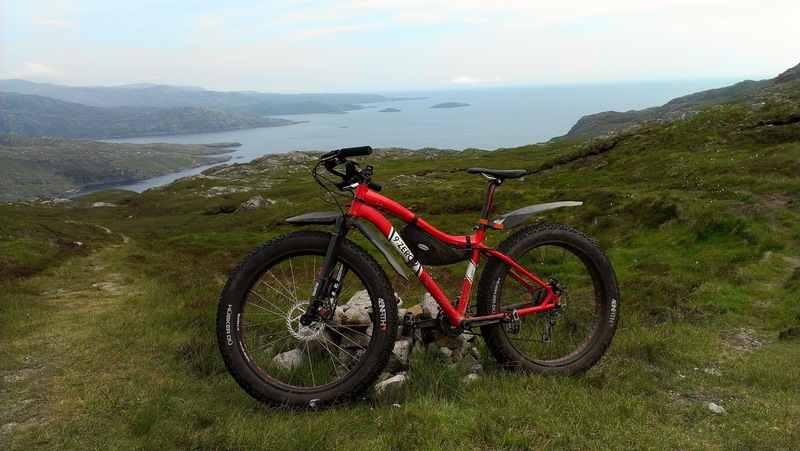 Amongst all the talk and scribblings on mountain biking in Scotland, two destinations are discussed in almost reverential tones - Torridon and Harris. The former has been on my mind a bit recently and I'm determined to get at least one trip up there later this year. In the meantime, a family holiday to visit the in-laws in Lewis gave me the opportunity to try one of the much-praised Harris routes. Although much of the mainland has had its wettest summer for a very long time, the far North-west and the Western Isles are actually reporting water shortages and we had already sat amused by the TV watching the floods down south while we were having 20 degrees and sun. Setting off for Tarbert in the van, the day had started with some low clouds although I was hoping they would burn off to leave us with another dry, warm day. After a brief stop at a local shop for some water and a wee snack I was at the start of the trail and contemplating what to wear. Although not exactly cold, the glen I was about to pedal up had a fierce headwind coming right towards me and I knew this would likely provide a wee bit of windchill. So, the Gore Alp-X jacket went on sans sleeves. 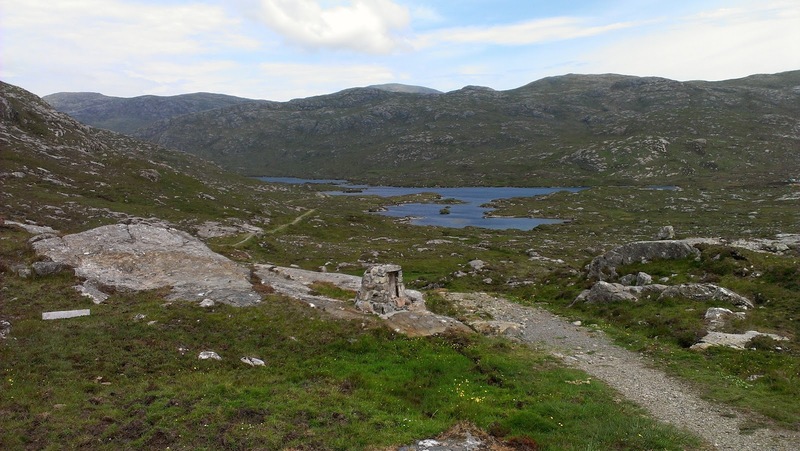 The path starts with a bit of a descent to the loch. Rocky steps and some very new-looking water bars added a bit of fun - until I had a quick look at the handlebars and noticed that my Garmin GPS had gone AWOL. Luckily, I didn't have far to backtrack to find it, but in trying to re-attach it, I noticed that it was no longer staying in place - as of the clamp had somehow got bent. As a result, the GPS ended up in my pocket for the remainder of the journey. Anyone expecting a "standard" highland singletrack will be pleasantly surprised at the condition of the track. Even allowing for the dry summer, it is very well constructed, with a good, draining gravel surface. As a result, I was to stay dry and mud-free the whole trip. Reaching the end of the loch, the path starts its ascent of the obvious col ahead and can be seen snaking up. It's all bikeable with a wee bit of effort and the cairn at the top (complete with a wee bit of deer horn and someones discarded tent poles) is a welcome sight. Crossing the hill ahead can be seen the road from Tarbert to Lewis and the path now starts its fast descent almost to sea level. This is a real blast. Height is quickly. lost and more rocky steps and water bars give a little bit of an edge, with the fatbike soaking it all up. I'm aware that there's a turn-off to be taken and, just in time, I see the marker post, turning East towards the little road that now makes its way to Rhenigidale. Before long, and after negotiating a couple of small gates, I'm on the road and then there is the 12% sign, marking the start of the long steep climb. Although this might not exactly be classic mountain biking, it's hard not to enjoy the route at this point, remembering that this road didn't exist until 1989 (and isn't on my OS map of this area!). Once the road flattens off, it's a pleasant trundle until the almost equally steep descent starts. At this point, I stopped to see the path I'd later be ascending. It looks a killer!! Although I had intended to go all the way in to the "village", the sight of a 13% gradient sign just after the turn off for the coastal path made me think better of it and soon enough I'm negotiating the contouring track, hugging the steep shoreline. Most of this proves to be rideable although I cautiously walk some sections, mindful of the remoteness of my situation and the potential consequences of a fall. After a couple of rises and dips, the path makes a beeline for a small beach, crossing a little wooden bridge. Ahead is the dauntingly steep climb known as the Scriob. Now - this might be a good descent for those with a head for heights and technical skills to match, but it doesn't take me long to realise it's well beyond me - in both senses. As a climb, it's a question of getting off the bike and simply grinding up each step, interspersed with the occasional lift/carry over the rockier steps. Of course, at this point I'm also shielded from the wind, so it's time for the local insect population to queue up for a bite at me. I think I'm getting away with it until a cleg takes a chunk out of my elbow, then flies off before I can swat it, only to return to the same point once the blood starts flowing!! If nothing else, this spurs me on to the breezier, easier angled top section of the path where I finally take a bit of a breather at a little cairn and waymarker at a junction in the path. From here, the rest of the climb is ridable and I'm soon at the summit, looking over towards Tarbert and the hills beyond. What follows is one of the most fun descents I've ridden. Fast, with some rocks to negotiate and of various levels of steepness. At last, I feel I'm getting some value for my recent efforts and the only thing slowing me down is the occasional need to get some feeling into my pumped-up wrists. After what seemed like quite a long time, but was actually only some 12 minutes, I'm back at the road with a little climb back to the van and the start point. My thoughts on the circuit? Well, it's certainly a ride on the wild side, but I didn't feel that the long climbs were suitably rewarded and I'm not convinced it would be any better in reverse. Comparing it to recent trips, the north shore of Loch Morar is by far the better ride. However, there are other routes in Harris and I'll be back!